In the short time since it was announced, a great deal has been written about the EU-Turkey refugee deal, with some commentators suggesting that the proposed arrangement represents a new turn in European asylum policy. In fact, it is simply the latest episode in a longstanding effort on the part of EU members and other industrialized states to curtail and manage the arrival of asylum-seekers. From the mid-1980s onwards, there was a steady rise in the number of asylum applications being submitted in the world’s more prosperous countries. Their response was to introduce a succession of measures intentionally designed to curtail that movement, including new visa requirements and pre-boarding documentation checks, sanctions on airlines and other transport companies carrying people without the requisite papers, the increased fortification of land borders, and many other such restrictive measures. Indeed, industrialized states continue to look very hard for alternative ways to curtail the arrival of asylum-seekers, and three are particularly pertinent to the current deal being negotiated between the EU and Turkey. The first is the establishment of “safe zones” in countries of origin—limiting the need and ability of people to seek asylum in other states. The second is that of “migration management” and “offshore processing” agreements, usually involving cooperation between the industrialized states and less prosperous countries in the same region. The third is that of legitimizing state strategies by securing the involvement of the United Nations High Commission for Refugees (UNHCR), the International Organization for Migration (IOM) and other international organizations. 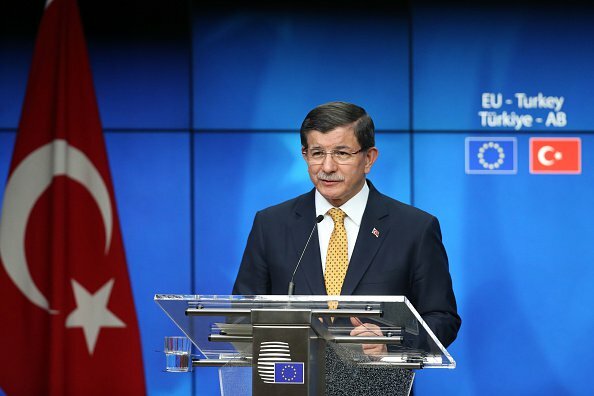 Prime Minister of Turkey, Ahmet Davutoglu, discusses the EU-Turkey migrant deal during the EU Summit in Brussels, Belgium. This is an extremely vague proposal, with no details as to how humanitarian conditions will be improved inside Syria. In addition, the communique says nothing about the right of Syrians to leave their country of origin and to take refuge in Turkey—an important omission considering that around 75,000 displaced Syrians have now congregated in the border area but are prevented from crossing into Turkey. Finally, the whole notion of safe zones in countries of origin has a generally dismal history. While the 1949 Geneva Conventions allow for the creation of hospital zones, neutralized zones and demilitarized zones in situations of armed conflict, such arrangements require consent between the belligerents and depend on complete demilitarization. Safe zones established since that time have clearly not met these conditions. In Bosnia in 1995, UN troops stood by as Serbian forces overran the safe areas of Srebrenica and Zepa and committed terrible atrocities there. In Rwanda in 1994, the safe area established by France provided a refuge for the very people who had organized the genocide. Turkey’s current desire to establish some kind of safe zone in northern Syria is highly questionable on humanitarian grounds.The one relatively successful safe area, established in northern Iraq in 1991 to halt a Kurdish refugee influx into southern Turkey, prevented the Kurds from exercising their right to seek asylum, required a massive military presence (a no-fly zone and the deployment of 20,000 NATO troops) and was underpinned by an agreement between the UN and the Iraqi government. While Turkey’s current desire to establish some kind of safe zone in northern Syria is understandable from a geopolitical perspective, it is highly questionable on humanitarian grounds. In terms of the strategy of migration management, a number of recent arrangements seek to limit the spontaneous arrival of asylum-seekers on the territory of prosperous states, by means of deals with less developed states in the same region. Australia’s so-called “Pacific Solution” provides one example. The migration agreement signed between Libya and Italy in 2011 provides another. A third example is the proposals issued by several EU politicians for asylum-seekers to have their claims assessed in North Africa, with countries in that region imposing strict controls on their ability to cross the Mediterranean. The proposed EU-Turkey agreement provides the most recent example of this phenomenon. But all four of these examples raise serious issues. Are they legal under international law? Are they ethical in terms of outsourcing the refugee problem to developing countries which are already hosting the vast majority of the world’s exiled populations? And are they operationally viable? The proposed EU-Turkey deal envisages the involuntary return to Turkey of any refugee arriving in Greece. But will people who have undertaken very difficult, dangerous and expensive journeys to that country simply acquiesce to their deportation? We should not be surprised about the eagerness of EU members to involve organizations such as UNHCR and IOM, given the competence and capacity that they bring to refugee situations, and, more significantly, the legitimacy that they can offer to contentious and possibly illegal state practices. And this is exactly what has happened in the past. Despite its initial reservations, for example, UNHCR played a central role in supporting the establishment of the northern Iraq safe zone, while IOM has been active in several aspects of Australia’s Pacific Solution. An important question now is whether UNHCR will agree to an involvement in the EU-Turkey deal, especially in its resettlement component, the size of which will be based on the number of involuntary returns from Greece and the Aegean Sea. As yet, the organization’s position remains unclear. UNHCR has emphasized that it is not a party to the deal and has expressed concern about any arrangement that involves the blanket return of all individuals from one country to another. But UNHCR will also find it very difficult to reject the agreement out of hand, not least because of the need to maintain a good relationship with Turkey, which is hosting a larger number of Syrian refugees than any other country in the region, and because EU and NATO member states provide around 80% of the organization’s funding. According to a recent article in the Financial Times, UNHCR has said that it would play its part in resettling refugees from Turkey to the EU, despite the concerns that it has expressed about the agreement to return new arrivals from Greece. Justifying such an involvement, a UNHCR spokesperson told the newspaper, “resettlement should not be conditional on external factors, and the protection needs of the individual remain the priority.” It is an ambiguous statement indeed, in a time where there is an urgent need for clarity as to UNHCR’s position in the EU-Turkey deal.